FREEBIES! Who likes freebies?!?! Well y’all already know I do and I don’t mind spreading the love…lol. So this month I suggest you head over to Free Beauty Events and find out what freebies are being given away or happening in your area. I say this all the time, but Free Beauty Events is an awesome site! You can find all kind of free stuff there…simply go to Free Beauty Events and enter your zip code. You will be able to search for free makeovers, gifts with purchase, spa open houses and sampling events happening at your local beauty retailers, spas and salons. It’s just that easy…Free Beauty Events is amazing! On select dates in October and November Ulta stores will be hosting Yes To events. Demonstrators will be giving information and letting customers try: Yes to Cucumbers Facial Cleansing Towelettes, Yes to Blueberries Eye Firming Treatment, Yes to Tomatoes Pore Scrub, and Yes to Carrots Facial Moisturizer. Also in November, Ulta will be hosting their Mustela event at select Ulta stores around the country where customers can get free samples. More info on the events like the ones above and more can be found on Free Beauty Events. If you or your company would like to feature your free event on Free Beauty Events..you can! It’s super easy and FREE. Simply submit your event here…that’s it. Like I said, for the month of October 2012, Free Beauty Events will be giving away 10 prizes. 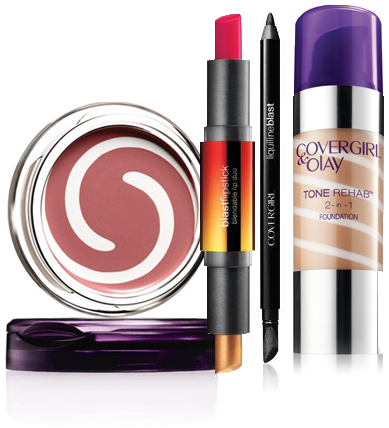 Each prize will consist of CoverGirl and Olay Tone Rehab 2-in-1 Foundation Base, CoverGirl and OLAY Simply Ageless Sculpting Blush, CoverGirl Blast Flipstick Lipcolor, and Liquiline Blast Eyeliner The Contest runs from 10/1/2012 to 10/31/2012, winners will be chosen on 11/1/2012 and notified by 11/15/2012. To enter, all you have to do is go to Free Beauty Events enter your name, email (only used to contact winners), and zip code. In addition to the monthly contest there is the Free Beauty Events Blog, where you will find product reviews on some of the latest beauty products on the market plus a weekly contest with smaller prizes too. You have until 10/31 to enter the monthly contest and the weekly contest are ongoing, so you will want to check them out now!And while you are there don’t forget that you can connect with Free Beauty Events on Facebook, Twitter, Google+, and Pintrest. This entry was posted in Savvy Tips and tagged beauty events, free beauty, free beauty events, Freebies, giveaways, Makeup, sampling events on October 15, 2012 by Roni the Savvy Housewife. On my way there to enter…!! On my way to enter now!! !